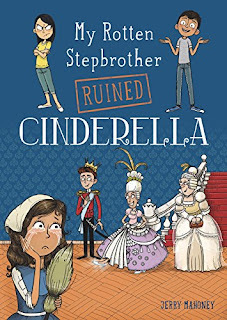 My Rotten Stepbrother Ruined Cinderella, by Jerry Mahoney (Capstone, August 2017) is a fun one for younger middle grade readers (9-10 year olds) who enjoy a fun fractured fairy tale. Maddie is a big fan of Cinderella, and she's proud of the diorama she made of the story for school. But her stepbrother Holden is not impressed with either, and points out the many logical flaws in the story; for instance, surely Cinderella isn't the only girl with that particular shoe size! And soon Maddie's diorama has changed to something not in the real story, and all the book versions have gone horribly wrong too. Holden's logic has broken Cinderella, and her happy ending is no more! Holden and Maddie magically enter the story (not of their own volition; it just happens), and once there Madddie's determined to set things right. Holden, though, is an uncertain ally at best, because he's more interested in things making sense, which isn't so useful when dealing with fairy tales. But the two of them manage to start tidying things up, starting with the stepsister who's now going to marry the prince; this wasn't her idea (she'd rather go to art school). The stepmother is the villain of the piece, and getting her out of the way of Cinderella's happily ever after turns out to be rather a tricky job. But once Cinderella and her stepsisters (one of whom is now Maddie, disguised by enchantment) put their past behind them and start working as a team, and once Holden and Maddie do the same, things fall into place. It's a lot of fun, and interesting to visit a well known story through Holden's fresh, critical eyes. The author also adds a rational explanation for the vexing question of why the prince needed the shoe fitting to recognize his true love again--he has face blindness. The resulting story is quite a bit more interesting than the original, although happy ever after is once again achieved (I found myself cheering more enthusiastically from the emancipated stepsister, now free to pursue her own dreams, than I did for Cinderella, who's romance still remains founded on the flimsy foundation of insta love...). There are many bits of very kid friendly humor, and the illustrations entertain as well. It's the sort of book you can start reading aloud to kids even younger than 9, and then leave lying around as bait for independent reading. Kids who enjoy this sort of disrupted fairy tale will then be happy to read the other books in the series, in which Holden ruins other stories in similar fashion. It is also a good teaching tool about thinking critically about plot, and learning to recognize plot holes; Holden makes many valid points! I am reading a book right now where the MC and her cousin enter a story by accident and have to fix things. It's a great concept for a story. I will be looking for this one as well. Thanks for the review. The young readers' version of The Eyre Affair?! Holden sounds like a great character. I love the idea of fractured fairy tales, but I wonder if there are so many fractured versions out there now that kids aren't ever reading the originals! Which would limit their appreciation of the fractured version, I would think.